SPRING/Sierra Leone conducted four barrier analysis surveys in 15 communities, across three chiefdoms in Tonkolili District, Sierra Leone, to identify “behavioral determinants” (factors that motivate or discourage) that affect the consumption of pumpkin and fish by pregnant women and children 6-23 months old. The analyses were intended to inform social and behavior change communication (SBCC) efforts to promote dietary diversity. To identify differences between doers (those who engage in the targeted practice) and non-doers (those who do not) on a set of key behavioral determinants, we used survey questionnaires from the CORE Group’s Barrier Analysis Facilitator’s Guide. Pumpkin is widely consumed by both groups during the rainy season when it is plentiful, but differences in consumption occured between groups during the dry season, when it is scarce. 2.7 times more likely than non-doers to say that giving a child pumpkin to eat prevents malnutrition. 3.2 times more likely to list good taste and texture of pumpkin as an advantage (positive consequence). 1/3 grew their own pumpkin rather than purchasing it. Many purchased pumpkin in small slices. 8.5 times more likely to say that health workers approved of pumpkin consumption while pregnant (perceived social norms) (p < 0.005). Reported lack of availability, high price, perception that it is difficult to store pumpkins in the dry season, and poor access to preferred quality of pumpkin much more frequently than doers. More likely to say that pumpkin was not always available in their village during the dry season (p < 0.005). 4.7 times more likely to say that feeding a child pumpkin can cause rashes (perceived negative consequences). More likely to purchase whole pumpkins (possibly limiting the frequency of purchase). Although fish is widely consumed daily in sauce, the amount consumed per person is low. 4.8 times more likely to say that fish consumption prevents malnutrition in children (perceived action efficacy). 3.9 times more likely to say that fish consumption prevents anemia in pregnant women (perceived action efficacy). Low availability and affordability, and limited access to the varieties desired were the biggest barriers to daily and year-round consumption of a beneficial quantity of fish. Another barrier was poor access to safe (smoked or frozen), high-quality fish. Fish is sold many days or even weeks old, with maggots present on occasion. How Will We Apply the Results? 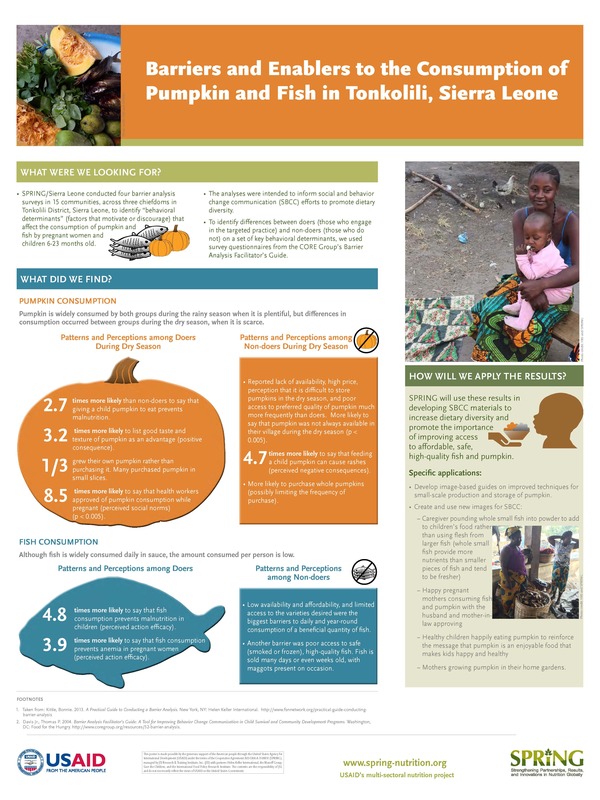 SPRING will use these results in developing SBCC materials to increase dietary diversity and promote the importance of improving access to affordable, safe, high-quality fish and pumpkin. Develop image-based guides on improved techniques for small-scale production and storage of pumpkin. Mothers growing pumpkin in their home gardens.